Begun by a dozen or so British artists in 2012, Brandalism appeared in London as a socio-artistic phenomenon and an anticapitalist revolt. The movement appropriated and hacked billboards and other advertising media in public space, becoming a new incarnation of the ad-busting practices that activated artistic competence as an activist tool in the battle against mindless visual consumption. Brandalism involves taking over commercial advertising space and installing visual materials similar to the original, but with a message critical of the brand. The example in this exhibition was made in the third wave of the Brandalism campaign and it accompanied the recent climate summit in Paris. 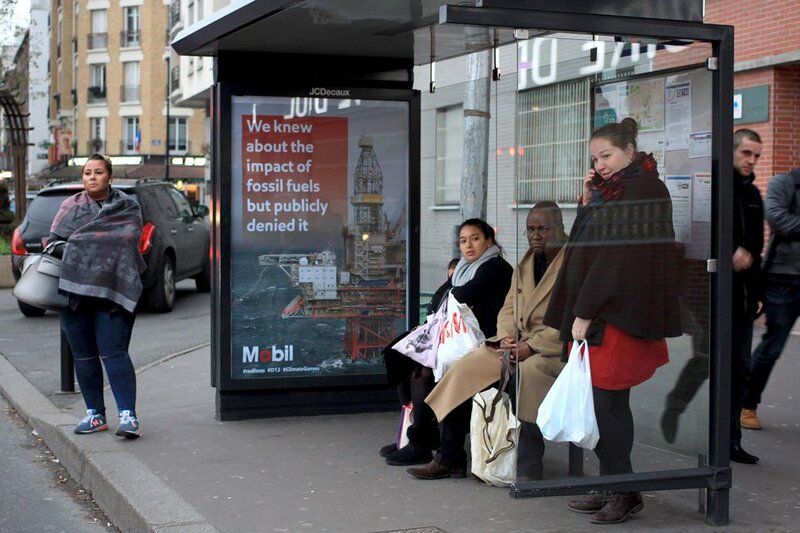 Created by the world-class designer Jonathan Barnbrook and displayed at a hacked bus shelter, it references the notorious Volkswagen scandal in which the auto giant tampered with the measurement of exhaust emissions. By appropriating elements of a brand’s visual identity, Brandalism exploits the power of advertising language to create an anticonsumption message. The report presented in exhibition consists of a version of a poster designed by Jonathan Barnbrook Studio and provided to the Museum of Modern Art in Warsaw for the duration of the exhibition. Courtesy Jonathan Barnbrook Studio.